Food for Thought: How Spiritual is your Spiritual Path? 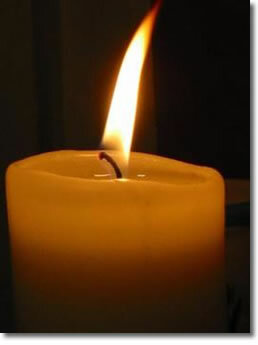 A single candle is all that is needed to illuminate that which is in darkness…. What is the nature of your Spirituality? Are Spiritual practices and Religion the same? Do you openly share your Spirituality with others, or is it private? Are you aware when your Spiritual beliefs are bothersome to others? Do you over extend your welcome? How accepting are you towards the beliefs of others? What do all Spiritual beliefs/Faiths have in common? How different is you present belief/faith to that of your family? How accepted are your beliefs? Are they vastly different from that of your friends and family? Does your partner share your sense of spirituality? On a scale of 1 to 10 (10 being highest), how important is your Spiritual practice? Do you need to enter a church to feel connected to God? How do you define God/Spirit/Life Energy etc? How do you feel about the concept of Heaven? Of Hell? What role does Fear play in your faith? These are only a few questions worth considering in the limitless space of Spiritual thought.May eyes open so the heart can see. May minds expand so walls tumble and doors vanish. A Ho my Brothers and Sisters. A Ho!